On July 10th at 12:00 pm the Youth and Ecological Restoration Program (YER) will have two youth, Michelle Burgess and Austin Waskul, lead a tour about Oyster River salmon. This YER, Phase II project is funded by Ministry of Children and Family Development (MCFD) and Comox Valley Regional District. In 2014 YER completed ten years of service for Comox Valley youth. A ten year review was recently posted to the YER website. The core principle of the program is youth build relationships with the YER coordinator, community volunteers and the natural world. They develop a sense of themselves being part of the ecological and human communities within the boundaries of our home place. Michelle Burgess sampling salmon in Millard Creek. This spring YER was invited by Comox Valley Project Watershed Society (PW) to be part of the Royston Salt Marsh Project in K’omoks Estuary. This first YER, Phase III project was funded through PW, UNIFOR Local 3019 and MCFD. One YERIII youth learned salt marsh species and restoration techniques; taught three groups of Royston Elementary School students; and then gave a power point presentation for PW. Austin Waskul moving coho fry at Oyster River. Oyster River Enhancement Society has a salmon hatchery operation in the park that includes a side channel network. 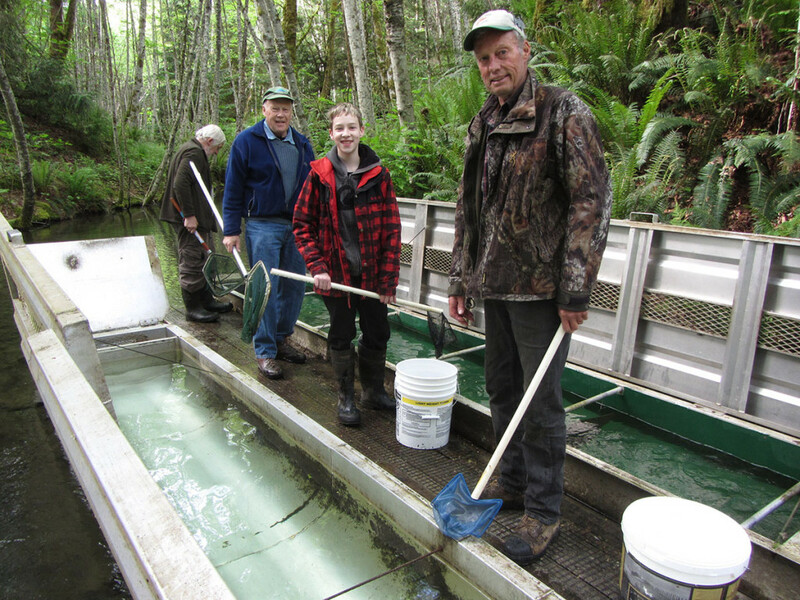 The YERII project has the youth working with the YER Coordinator and Biologist, Ian Moul, on a juvenile salmon estimate in Channel #1 and concludes with the tour. Please join us for this youth led tour at Bear Creek Nature Park on July 10th at 12:00 pm. Follow the old Island Highway north, go left on Hamm Road, then right on Macauley Road to the park entrance on the right and drive to the upper parking area. See you there. Hello Wendy, ! Thank you for invite ! Will be at work so can’t make it . I would really Have enjoyed the tour , meeting the tour guides and learning about this important work. Hats off to you and your crew for all you do ! !